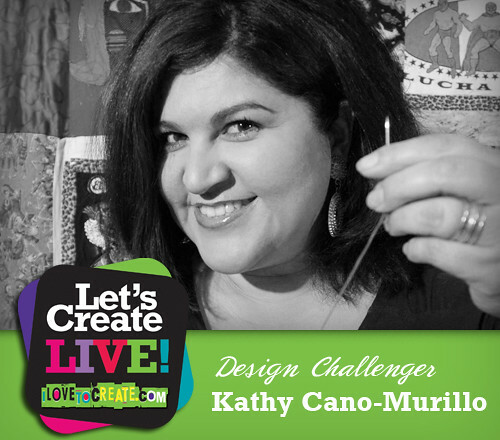 If you've been a fan of iLoveToCreate for a while, you already know Kathy-Cano Murillo, a.k.a. Crafty Chica very well. Kathy is slated to appear this Thursday (9-11 AM PST) as a celebrity designer on our Let's Create LIVE webcast and we are so excited to see what colorful and vibrant craft she makes from the assortment of Designer Challenge goodies we sent her to play with! Kathy has been inspiring online crafters of all backgrounds and skill levels for over 10 years. In May of 2011, she'll be celebrating her 10 year anniversary of her newly redesigned Craftychica.com! She shares all kinds of inspiring projects, articles, and products on her site. Her work has been featured in the New York Times, USA Today, and NPR. Kathy has worn many hats during her career, she's been a handmade artist selling her custom "Chicano Pop Art" in her Crafty Chica store and to retailers. She's also been a syndicated newspaper writer for the Arizona Republic newspaper. 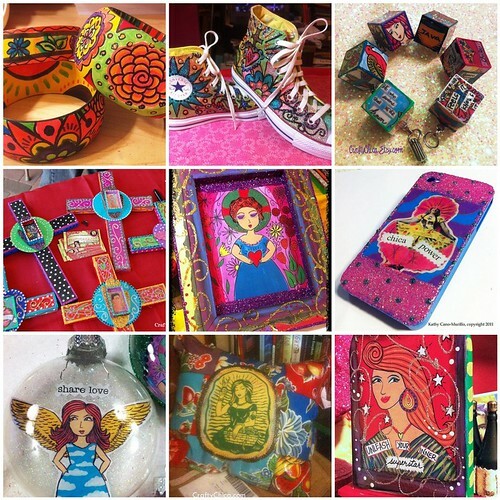 In 2008, iLoveToCreate launched her Crafty Chica® product line, spreading her love of color and glitter to the masses! In addition to the 7 craft tutorial books Kathy has written, Kathy has recently taken on the role of novelist. Her "Crafty Chica Novel" series debuted in March 2010 with Waking Up in the Land of Glitter (Grand Central Publishing). Her next book, Miss Scarlet's School of Patternless Sewing was released in March, 2011. Kathy also does exclusive projects for our blog and web site. Here's just a small sampling of the many crafts she makes!! Here's a link to more Crafty Chica projects! We sat down with Kathy and asked her a few fun questions. Here's her interview! 1. You are about to hit your 10th anniversary of www.craftychica.com!That’s a huge milestone! How has your site changed over the past 10 years? Thank you! The time has passed very fast. It started as a late night hobby - and it still is a late night hobby, but on a much bigger scale. I love writing, blogging, sharing and posting ideas. Running my web site has helped me reach crazy goals and dreams. It has always been a place to "put it out there" - and then live up to it and follow through. In the early days, if you look through my posts, that's where I have the goofiest content. I shared *everything* that went on in my life, not thinking anyone would ever read it. I've grown as a person and am a little more private now. But I love looking back and reading stories about my kids and my failed craft attempts. I'm amazed at how much the online landscape has changed. I remember when I started my Diary of a Crafty Chica blog in 2003, I told an online editor at the newspaper where I worked that we should start them there - she told me that blogs were a fad and laughed it off. Look how far we've all come! 2. Is there anyone you’ve ever met that could rival your obsession with glitter? Oh there are plenty! We are all in the Secret Society of Sparklehood! I think it is important to remind people that glitter is a state of mind and it is good to carry it with you in some way, shape or form. If you don't like the tangible loose stuff, then think of being nice to a stranger as your personal glitter. :-) Spread it far and wide! 3. You are now a successful novelist! How is writing a novel and being an author different than being a designer? Thank you! It's actually more similar than you think! It's like one big cohesive art collection, with many small working parts that have to be embellished, make a statement, be memorable and polished. Lots of planning, yet spontaneity rules...the creative process takes over and sets you free! I compare it also to a big canvas. You have the theme, the background, the setting, color palette, focal point, the accents. However, it's very different because there are no art supplies in front of you. The Lazy Susan you spin for tool selection is in your head. The supplies are in your imagination and you have to hunt for them and sometimes be able to see and catch them when they float by in front of you. I love writing novels. I think it is a great exercise for artists to dabble in, it really exercises a new part of your creativity! 4. What words of wisdom did someone give you that you still follow and apply to your life today? Don't do it for the money, do it because you love it - and the money will come. Stay focused on why you started your business in the first place. Sometimes I really have to check myself on that one. I started all of this because I love to create and write. But being a one-woman operation, my time is often devoted to marketing, research, assignments, appearances - and I have have NO time to do what I originally wanted to do. It's times like that that I make myself stop and go back to square one, that is where the magic lives. 5. Do you have a current guilty pleasure? Reading books and traveling! I'm currently reading The Peach Keeper by Sarah Addison Allen. I'm also excited to get going on my next novel. Another recent guilty pleasure is traveling. I just returned from Mexico on the 5th Annual Crafty Chica Art Cruise. I'm planning the 6th, as well as a Crafty London group tour too. I also just got invited to teach on a cruise ship going to the Caribbean this fall. I love that my passion for crafting has taken me on so many awesome adventures! Here's a fun glitter on glitter tutorial Kathy shared on her Crafty Chica YouTube channel! Thanks Kathy for sharing your crafty spirit and inspiration with us! Great interview with a totally awesome artist who's full of glittery goodness! The Crafty Chica aka Kathy is a great asset to have around.